Were all animals made clean? What about the unclean animals shown to Peter in a vision? Here is a straightforward Bible answer, giving the New Testament teaching. This subject is important to your health and well-being! Observe a little baby. It seems to think that anything and everything its little chubby hands can get into its mouth is good to eat — and everything baby gets his hands on goes straight to his mouth! How often must young parents take things away, and try to teach the lovely little bundle of humanity that everything one's hands can touch is not necessarily good for the digestion! We're Just Grown-up Babies! Well, one might wonder if any of us has grown up! Most of us adults still seem to think that anything we can stuff in our mouths is good for food. About the only difference between us and the baby is that baby puts into his mouth whatever looks good, while we employ the sense of taste in deciding what goes into our mouths. Yes, we are very careful what we "feed" our automobile — and totally careless and indifferent about what we feed ourselves and our children! What happens to the food you eat? In the stomach the digestive process takes place. And, once digested — if you have eaten fit and digestible food — a portion of the essential minerals and vitamins — the life-giving properties in the food — filter through the intestinal lining into the bloodstream to replenish and build up decaying cells, to pro­ vide energy, body warmth, good health. If you tried to oil a fine watch with axle grease you wouldn't expect the watch to keep good time. And when you put into your stomach all kinds of foul things which the Great Architect who de­ signed your human mechanism never intended, you foul up your body and bring on sickness, disease, aches, pains, a dulled and clogged­ up mind, inefficiency and inability — and you commit suicide on the installment plan by actually shortening your life! You Are Eating Poison! You don't eat every plant that grows out of the ground. Some things that grow are poison, not food. The only difference between these poisons we falsely call foods and potassium cyanide is the relative number of minutes, hours, or years it takes to accomplish its mission. Just as every plant that God caused to grow out of the ground was not designed for food, so it is with animal flesh. Some will say, "Well, if swine's flesh isn't supposed to be eaten as food, what did God create swine for?'' You might as well ask, what did God create weeds and poison vines for? Everything may have been created for a purpose, but not everything for the purpose of eating. Now some believe that in the original creation — in the Garden of Eden — God did not intend any animal flesh to be eaten. God's revelation on that point is vague, and many have argued it both ways. However, God has clearly revealed that certain animal meats may be eaten as food now, in this age, and Jesus who came to set us an ex­ ample did eat flesh as well as vegetables and fruits, and so do I. What the Great Architect of Your Stomach Instructs. When the first written revelation of God came to man though Moses, God instructed man as to which kinds of animal flesh man ought or ought not to eat. You will find this list in Leviticus 11 and Deuteronomy 14. This is a basic law — a revelation from God to man about which kinds of flesh will properly digest and assimilate in the human system, and which will not. It is not a part of God's great spiritual law, summed up in the Ten Commandments. Neither is it part of the ceremonial, ritualistic, or sacrificial laws later abolished at the crucifixion of Christ. It is necessary to recognize that God is the Author of all law, and there are countless laws in motion. There are laws of physics and chemistry. You know of the law of gravity. There is the great immutable spiritual law to regulate man's relationship to God and to fellowmen — the law of love — the Ten Commandments. God gave His nation Israel civil statutes and judgments ­ national laws for the conduct of the national government. Israel was also His Church, under the Old Covenant. And for the dispensation then present God gave Israel rituals and ceremonial laws for the conduct of religious services, laws relating to typical and temporary sacrifices, meat and drink offerings — temporary substitutes for Christ and the Holy Spirit. Those laws, of course, ended when the Reality came. Let us get this straight and clear! We usually speak of sin in its spiritual aspect. That is the aspect in which it is considered in the New Testament. The Bible definition of it is this: "Sin is the transgression of the law" (I John 3:4). The penalty for violation of that spiritual law is death — not the first, or physical death, but the second, or spiritual and eternal death in the "lake of fire" (Rev. 20:14). That is what Jesus made plain, as recorded in Mark 7: 14-23. Here Jesus was speaking of spiritual defilement, not physical health. Not that which enters into a man's mouth, but the evil that comes out of his heart, defiles the man spiritually. What defiles the man — and he is speaking of defiling the man, not injuring the body — is transgression of the Ten Commandments –evil thoughts, adulteries, fornications, murders, thefts, covetousness, blasphemy (verses 21-22). These things have nothing to do with the physical laws of health. He was making a point concerning spiritual defilements, not physical health. No Change in Structure of Animal Flesh at Cross. The animals whose flesh properly digests and nourishes the human body were so made in the original creation. No change was ever made in the structure of men's bodies at the time of the flood, or at the time of Jesus' death, or any other time. 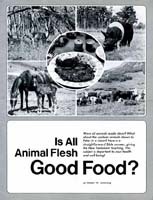 Neither did God make some sudden change in the structure of animal flesh, so that what once was unfit for food will now digest properly and supply the body's needs. Notice, before the flood, Noah took into the ark of the clean animals, to be eaten for food, by sevens; but of the unclean, of which he was not to eat during the flood, by two's — only enough to preserve their lives. The inference is inescapable that the additional clean animals were taken aboard to be eaten for food while Noah and his family were in the ark. Prior to the flood, .clean animals were usually offered as sacrifices. Those who ate the sacrifices often partook of the animal flesh, but vegetables were the main constituent of diet. After the flood God gave Noah not merely the green herb — vegetables — as the major part of diet, but of every type of living creature — clean animals, clean fish, clean fowl (Genesis 9:3 and Leviticus 11 ). Genesis 9:3 does not say that every living, breathing creature is clean and fit to eat, but that "as the green herb have I given you all things." God did not give poisonous herbs as food. He gave man the healthful herbs. Man can determine which herbs are healthful, but man cannot by himself determine which flesh foods are harmful. That is why God had to determine for us in His Word which meats are clean. Since the flood every moving clean, healthful, nonpoisonous type of animal life is good for food — just as God gave us the healthful, nonpoisonous herbs. Not Ceremonial Law. The instruction in Leviticus 11 and Deuteronomy 14, then, is not some ritualistic regulation for the Mosaic period only. Why do so many people have the idea that God is some great unfair monster who imposes foolish hardships on His people? Whatever God instructs us is for our good, not some nonsensical restriction for one period to be changed around some different way for other people of a different period. Now for some specific instruction concerning mammals: "These are the beasts which ye shall eat: the ox [beet], the sheep [lamb], and the goat, the hart, and the roebuck, and the fallow deer, and the wild goat, and the pygarg [antelope], and the wild ox, and the chamois [mountain sheep]. And every beast that parteth the hoof, and cleaveth the cleft into two claws, and cheweth the cud among the beasts, that ye shall eat. Nevertheless these ye shall not eat of them that chew the cud, or of them that divide the cloven hoof; as the camel, and the hare, and the coney: for they chew the cud, but divide not the hoof; therefore they are unclean unto you. And the swine [hogs], because it divideth the hoof, yet cheweth not the cud, it is unclean unto you: ye shall not eat of their flesh ..." (Deut. 14:4-8). Horsemeat is not fit for humans because horses not only do not have divided hoofs, but they also do not chew the cud. The context is really the heart of the matter of what Jesus actually means by "purging all meats" (verse 19). We take no exception to the view that after food has passed through the digestive tract, it has been purged or made clean. But how? The whole context of Mark 7 shows that it is a question of ceremonial cleanliness-no/ any law in the Old Testament, but instead the ritual purity which certain Palestinian sects had proclaimed on their authority. The Greek word broma (if not taken to mean "filth" as some authorities suggest) means simply "that which is eaten" or "food," and includes all kinds of food (see Bauer-Arndt-Gingrich). To limit the words "purging all meats" to flesh foods is unjustified by the straight­ forward reading of the Greek. The context (verses 1-14, 20-23) deals, not with biological uncleanness, but with uncleanness supposedly incurred from the omission of ritual washing (verse 15). The kind of food the disciples ate (verses 2, 5), is not referred to, but only the manner in which they ate (verses 2, 5, 15). The context throughout shows Christ dealing with the problem of the "commandment of God" versus the "tradition of men." Another point: there is no commandment in the Old Testament that forbids eating food with dirty hands. The Pharasaical tradition is in question here, not any of God's Word. shrimp, crawfish, dogs, snakes, rats, and skunks. The only seafood fit for food are fish having both fins and scales. Halibut has both and is clean. Catfish is a skin fish — unclean. It's all a matter of what we have become accustomed to doing. It seems strange and horrifying to hear that some Orientals eat mice as a delicacy. But many Orientals are horrified to hear that we eat nasty, slimy, filthy oysters! But some human grown-ups, like little babies, will eat anything they can get their hands on and stuff into their mouths. At so-called "quality" grocery stores in large towns and cities, specializing in rare delicacies, you can purchase "delicious" canned rattle­ snake — if you care for it. So far as I am concerned, you may have my portion if you wish to try it. I do not care to eat it for the sa me reason I do not eat slugs, skunks, cats, or eels — for the sa me reason I do not eat poison ivy or weeds. Yes, and for the same reason I do not put fuel oil mixed with sand in the gas tank of my car! The day will come when we will at last learn that eating greasy hog flesh and other unfit "foods" has been a prime cause of cancer and other deadly diseases. What About Peter's Vision? But what about the sheet containing unclean animals which was shown to the Apostle Peter in a vision (Acts 10)? Did this vision change the entire composition of all unclean animals, or of the human apparatus, so that these unfit things suddenly became nourishing food? The purpose of this v1s1on was NOT to change God's food and health laws which have been inexorably in motion from the beginning, but to show Peter "that I should not call any man common or unclean" (Acts 10:28). Why? Because the Jewish people had been taught to regard Gentiles like unclean animals — to have nothing to do with them. It is time you fully understood this vision. It may well affect your health, happiness and eternal life. Open your Bible to the tenth chapter of Acts. Notice that Cornelius was an Italian soldier — an uncircumcised Italian — a Gentile by race. To the strict Jews, he was to be regarded as an unclean man. But God looks on the heart. Cornelius gave "much alms" to the Jewish people (verse 2). God remembered his alms and revealed in a vision that he should send some of his servants to Joppa to contact Peter. In verse 9, we find Peter was a man of prayer. While praying on a house­ top, Peter became very hungry. Just before noon Peter fell into a trance. In vision he saw heaven opened and a sheet was let down to the earth. This sheet contained "all manner of four­ footed beasts of the earth, and wild beasts, and creeping things, and fowls of the air" (verse 12). Notice this carefully, This sheet contained every type of animal imaginable, including wild animals — lions, tigers, hyenas, monkeys, skunks. And creeping things — snakes and lizards, vermin and spiders. And fowl like vultures and crows and eagles! Peter was shocked by the sight of all these creatures. Then, of all things, God commanded Peter to kill and eat of these creatures! What did Peter say? "Not so, Lord; for I have never eaten anything that is common or unclean" (Acts 10:14). Peter had lived day and night with Jesus for over three years. He certainly understood from Jesus' teaching that there were some creatures which are simply not fit for human food. That is why when this vision came ten years after the rituals and ceremonies were abolished at the cross, Peter refused to eat. He knew that God's law of clean and unclean meats was still in full force and effect! Now notice what the voice from heaven told Peter when he refused to eat: "What God hath cleansed, that call not thou common" (verse 15). It does not say that what God cleansed were these revolting unclean reptiles, fowl and wild animals. It does say that what God cleansed is not to be called common! But what did God cleanse? What God Really Cleansed. In this vision which Peter saw, the voice from heaven spoke three times, then the sheet was received up into heaven again. And what did Peter do? "Peter doubted in himself what this vision which he had seen should mea n" (verse 17). He did not immediately assume like so many people that God suddenly changed His laws ten years after the crucifixion! Now notice what happened! "While Peter thought on the vision, the Spirit said unto him, 'Behold, three men seek thee. Arise there­ fore, and get thee down, and go with them, doubting nothing: for I have sent them'" (verses 19-20). The voice from heaven in the vision spoke unto Peter three times because three Gentile men — two servants and a soldier (verse 7) — were at that moment on their way to see him. Peter went with them to see Cornelius. This is when Peter under­ stood the vision! He confessed in verse 28 "... God hath shewed me that I should not call any man common or unclean." "What God cleansed" were not those unclean animals, but those Gentile men, formerly regarded as unclean by the Jewish people. Those unclean animals in Peter's vision were used to symbolize the Gentile races of men. The Jewish people had been forbidden to associate with them because of their abominable practices. But now this wall of spiritual separation had been broken down and salvation was extended to the Gentiles. Peter finally realized that this was the meaning of the vision and said, "Of a truth I perceive that God is no respecter of persons: but in every nation he that feareth him, and worketh righteousness, is accepted with him" (verses 34-35). Yes, to be accepted with God, we must fear Him and work righteous­ ness. What is righteousness?"... All thy commandments are righteous­ ness" (Psalm 119:172). And among those commandments are the laws which tell us which kinds of flesh are clean and which are unclean! Would You Eat Skunks and Rats? But suppose God had been trying to tell Peter — and us — that he should eat all the things contained in the sheet that was let down in vision. Would yo u eat those "creeping things" — lizards, snakes, spiders? Would you eat skunks and hyenas? Of course you wouldn't! Why? Because you have your own law of what you think is clean and unclean! Common sense tells us that God did not intend for us to eat every There is not a single scripture creature. But we just aren't willing showing that God ever set apart as to let our Creator tell us which fit for food any unclean creatures — meats will give us lasting health and which ones are injurious to our bodies, and will eventually bring on more sickness and disease. It is time we let God tell us what is clean and what is unclean instead of using our faulty human reason! Notice that these "doctrines of devils" include "commanding to ab- stain from meats which God hath created to be received with thanksgiving …." By whom? "Of them which believe and know the truth." What is truth? Christ said, "Thy Word is truth" (John 17: 17). Then the Bible itself reveals the truth concerning which meats are good for food. We should not refuse to eat any food which, according to truth, God created to be eaten with thanksgiving. But this does not mean that all meats are healthful and fit for the human body. Notice that the false doctrine is commanding to abstain from meats which are thankfully received by those who believe and know the truth — who know God's Word. But God's Word — the Holy Bible -tells us that there are some meats which are "unclean," and are not to be received with thanksgiving! "Sanctify" is a word meaning to make holy, or set apart for a right use or purpose — to set apart as fit for human food. Now which meats has God sanctified for hum a n food? The only passages in all the Bible showing which meats God sanctified are found in Leviticus II and Deuteronomy 14. Here you find that it is the "clean" cause you have your own law of — healthful — meats which are good what you think is clean and un- for food. These are the only meats clean that can be received with thanksgiving and prayer! There is not a single scripture showing that God ever set apart as fit for food any unclean creatures -snails, oysters, clams, snakes, octopuses, eels, horses, rabbits, or swine! Yet people eat these creatures with- out realizing the harm they are doing to their bodies. Paul Instructs Vegetarians. Paul's letter to the saints at Rome is often quoted as supposed proof that any kind of flesh food is good to eat. But is this what Paul really taught? Turn to the beginning of the 14th chapter of Romans. Notice what the apostle is writing: "Him that is weak in the faith receive ye" — don't dispute with him and sit in judgment on him because of his weak under- standing of the faith, Paul continues. "For one believeth that he may eat all things, another who is weak, eateth herbs [vegetables only]" (Romans 14:1-2). Of whom is Paul writing? Of those who were vegetarians, as well as those who believed in eating both fresh foods and vegetables. Paul was confronted with the same problem that we encounter today in carrying the Gospel to the world. You would be surprised at the number of people who do not eat meat or even any animal products — milk, butter, cheese, eggs. Some have meatless days or days on which they will eat fish only. These are all people who, because they are weak in the faith, abstain from those clean meats which God originally sanctified or set apart in His Word for man's physical nourishment. The question confronting Paul was not that Christians at Rome contended that all unclean animals had now been cleansed by God — the common false assumption of today — but the real issue, according to verse two, was over the vegetarian belief held by some that no meats whatsoever should be eaten . Paul was straightening out the brethren on this matter, telling them that none of those clean meats which had been created by God to be received with thanksgiving should be refused. He pointed out to them, however, that it would be wrong for the vegetarians to eat meat if they had doubts about it, thereby defiling their weak con­ sciences. For he wrote, "…Happy is he that condemneth not himself in that thing which he alloweth. And he that doubteth is damned if he eat, because he eateth not of faith: for whatsoever is not of faith is sin" (Rom. 14: 22-23). We must follow what God has revealed to us to be right according to the Word of God. This does not mean that our consciences always tell us what is right — not at all. We have to continually study to learn what is right and wrong. But God thinks more highly of a vegetarian who might sincerely and conscientiously deny himself the clean meats, because he does not know the full truth, than He does a person who would do the right thing ac­ cording to the letter, but who really believes in his heart that he is doing wrong. So "to him" — the vegetarian — "that esteemeth anything to be common, to him" — the vegetarian – "it is common." That is, it seems so to him. But it is not common in fact, nor to us, for we know that all clean meats are good for food. That is why Paul wrote: "I know, and am persuaded by the Lord Jesus, that there is nothing common of itself" (Rom. 14: 14). Notice that in this verse Paul used, according to the margin of the King James Version, the Greek word for "common," not the Greek word for "unclean." Why? "Common" Does Not Mean "Un­clean." Many have carelessly assumed that Paul is writing about unclean meats in this 14th chapter of Romans. He is not! He is writing about the difference between vegetarians who regard that clean meats are common, and those who know that clean meats are of themselves not common. In the Greek there are two different words used which are often carelessly translated "unclean" or "common." Notice that in Acts 10: 14 both of these words are used. The Bible does not repeat itself foolishly. Therefore these two words mean entirely different things. Paul used the Greek word for "common" throughout Romans 14: 14. He did not use the Greek word for "unclean." In other words, Paul knew that no clean foods which God has sanctified are by nature polluted, but vegetarians who were weak in the faith — weak in understanding God's Word — thought meats should not be eaten. To such a vegetarian — "to him," not to others — that meat seemed to be polluted. His conscience defiled the meat for him; he would become upset if he were to eat meat. But that does not make the meat polluted in fact or for everybody else. Notice Paul's conclusion: "For meat destroy not the work of God. All things indeed are pure" — that is, all things that God sanctified and gave us to eat are clean — "but it is evil for that man who eateth with offense. It is good neither to eat flesh, nor to drink wine, nor any­ thing whereby thy brother stumbleth ..." (verses 20 and 21). When Is "Clean" Meat "Common"? The only circumstance in which clean meats are ever common or polluted is when the clean animals have died of themselves or when the blood has not been properly drained. That is why the apostles and elders who gathered at Jerusalem forbade the use of meat from strangled animals and meat with the blood in it (Acts 15:20). This is New Testament teaching for today! Such animal flesh was called "common" because it could be given to strangers or aliens in Old Testament times if those people wanted to eat it. They were the common and polluted people — the Gentiles — not the chosen and clean people, Israel (Deut. 14:21). "Conscience, I say, not thine own, but of the other" (verse 29). That is why Paul said in Romans, "But to him that esteemeth any thing to be common [margin], to him it is common" (Rom. 14: 14). Prophecy for the Future. What does the Bible say the people would be doing today? Notice: They that eat "swine's flesh" — that is what most people are doing today — "and the abomination, and the mouse, shall be consumed together" — in the wrath of God — "saith the Lord" (Isa. 66:17). This is the fate of those who lust after the foods which God forbids us to eat because those meats will harm us. This is the fate of those "whose God is their belly" (Phil. 3: 19). Is it any wonder today, that with all our scientific knowledge, we have more doctor bills, more sickness than ever before in the history of the world? It is time we returned to God and began to obey His laws. He is our Creator. He made us. He knows what our bodies were made to uti­ lize as good, healthful foods. He set the laws in motion regulating clean and unclean meats. It is time we began to obey them as Jesus and the apostles did! What About Fish and Fowl? The Bible itself defines which sea life is good food: "Whatsoever hath fins and scales in the waters, in the seas, and in the rivers, them shall ye eat" (Lev. 11:9). In verse 10 it is further clarified: "And all that have not fins AND scales in the seas ... they shall be an abomination unto you." "But which fish have both fins and scales?" is the question asked by ma ny readers. First, let us name the commonly known unclean fish — these are scaleless fish — which are not fit for food: catfish, eels, paddlefish, sculpins, sticklebacks, sturgeons and swordfish. These fish do not have true scales. Together with these creatures are other forms of sea life unfit for human consumption: abalone, clams, crabs, lobsters, oysters, scallops, shrimp, whale. A more complete list of fish fit for human consumption is available on the next page. The most important clean fish — having both scales and fins are: albacore, anchovy, barracuda, bass, blackfish , bowfin, buffalo, carp, characin, cod, croaker, darter, flounder, gaby, grayling, haddock, halibut, herring, jack , mackerel, minnow, mooneye, mullet, needlefish, perch, pike, salmon , sardine, shad, silverside, smelt , snapper, sole, sucker, sunfish , surf fish , tarpon, trout, tuna, weakfish , whitefish. If any question arises, consult such books as Field Book of Fresh- Water Fishes by Ray Schrenkeisen which may be found in public libraries. The second part of the question concerns fowl. Which birds are fit for human consumption? The answer is found in Leviticus 11:13-19 and Deuteronomy 14: 11-20.
sands found the world over. These unclean birds illustrate the characteristics of all unclean birds. They fall into types each of which is unclean "after its kind." The question is, how do these unclean birds differ from those known to be clean or fit for human consumption? The characteristics of clean fowl are, of course, determined by the dove and the pigeon (Luke 2:24 and Lev. 1:14-17) which were anciently used for sacrifice. Unclean birds not listed specifically in the Bible are roadrunners, woodpeckers and the parrot family (which divide their toes so that two are on either side of a perch), aquatic and wading birds and gulls which have no crops or craws, no double lining of gizzards, and often no hind toe or no elongated middle front toe.